“Master of the Light” is a nickname given to Kuinji by other artists. Since for them it was always a secret to his unusual talent to depict light so real that it seemed as if it was not a picture, but a photograph. Until now, many artists in the confusion look at the pictures and do not understand how and how to transmit the light of the moon or the sun’s rays, so that, looking at them, squint. The work “Birch Grove” was written in 1879. The canvas depicts a bright, radiant and, sparkling by the sun, day. Everything is calm and quiet around, a kind of indescribable joy and delight settles in the soul. So skillfully depicts a corner of the birch forest, absorbed by the game “bunnies”, that involuntarily you become a witness to an unusual presentation – the sun’s rays are woven into the hanging branches of birches and “roll” on them, blown by a light summer breeze. And it seems that if you listen, you can hear the rustle of leaves and the singing of birds, the chirping of grasshoppers in the high and soft grass. The fullness of the contrast of green color and its shades allows you to get a closer look at the depth and pomp of the birch forest. Next, we are transferred to the stream, which, with its fresh and cool stream, takes us into the depth of the canvas, to a place where it can no longer be seen. However, the feeling of freshness and purity sharply creates a contrast between the summer heat and the saving coolness of the clear waters of the stream. In order to give the forest density and depth, the artist draws dark silhouettes on the background of the painting, but does not give them a specific shape, which indicates that the most important thing here, before our eyes, is stretched out of the palm. 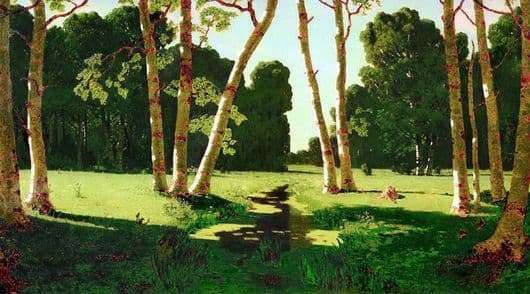 Kuindzhi achieves such subtlety of light effects with the help of a correctly chosen composition of color and contrast. After all, so subtly you can feel the light, being in darkness. Therefore, the author prefers to combine dark tones with light ones, so that some of them stand out against the background of others by their depth and purity. The dark forest gives us the opportunity to more clearly perceive the blue sky and almost glowing birch trunks. The artist is in admiration of the Russian landscapes, because it is the Russian forest that is full of thoughts and hopes, desires and prayers, which are clearly felt, when you get into this wondrous nature.